Kim Michele Richardson is a LibraryThing Author, an author who lists their personal library on LibraryThing. See Kim Michele Richardson's author page. About mewriter, wife and mother. 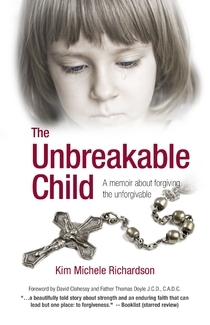 The Unbreakable Child, a memoir about forgiving the unforgivable. “A harrowing, but beautifully crafted saga of one woman's courageous fight against evil, and her victory over the greatest titan in history--the Catholic church. This is a book that will haunt you”. -- Alanna Nash, author, "The Colonel." Kentucky in the 1960s, recounts the horrors that she and countless other children endured there and takes readers on her journey to rid herself of the awful memories. Her catharsis comes with a lawsuit, which she and 44 other survivors brought against the order that ran the orphanage. Richardson tells two simultaneous stories. In one, she recalls episodes from her childhood where her “misbehavior” … led to unheard-of punishments. In the other, she takes us through the steps of the lawsuit, from the first meeting with the attorney to the first deposition where a sister was present to, finally, a settlement, the first of its kind against Catholic nuns. Richardson’s candid accounts are chilling, and the strength she shows—with a very supportive husband at her side—is inspiring. Remarkably, she did not abandon the Church and in fact sends her children to Catholic schools. Hers is a beautifully told story about strength and an enduring faith that can lead but one place: to forgiveness.